Many less sophisticated lipo devices on the market use diode laser as the medium to remove fat. Although this has been proven to stimulate the fat cell to release fat it is dependant on significant immediate exercise on behalf of the client to metabolise the released fat in order to achieve results. 3D-Lipo utilizes the latest generation technology called ultrasound cavitation and duo cryolipolysis (fat freezing) which are widely recognised as two of the most effective circumference techniques available. In addition to this, 3D-Lipo incorporates 3D-RF for skin tightening and cellulite reduction. Further more there is no nee to exercise post treatment in order to obtain results. 3D Lipo is an amazing treatment and the results are phenomenal. We aim to provide a full bespoke plan of your needs and tailor a package best to suit you. Cavitation is a fast, instant way to reduce stubborn at. An ultrasound treatment that gives instant results after 1st treatment. A weekly treatment that lasts up to 60 minutes. The ultrasound breaks down the fat cells and cell membrane. You as a client will then eliminate these toxins out by drinking water. This then flushes through and every client will be recommended a bespoke plan. A course of 8 treatments to be taken weekly for best results. This is a fantastic treatment for both skin tightening and anti-cellulite reduction. Radio frequency for anti-cellulite penetrates the deeper levels of fat targeting the fat layer and uneven skin contours to leave a more defined skin tone, great for the legs. If removing fat bulk, this is not your option. Targets stubborn fat pockets of fat by eliminating 20-40% of the fat cells on the area chosen. The fat cells are destroyed by freezing them to -6 degrees. Full results will be visible after 2-4 months. Incorporate into a cavitation fat burning course for increased results in that area. This treatment has minimum down time. We recommend a course of shockwave for optimal results after treatment. Targeting the stubborn fat on the love handles, abdomen, and thighs. This is a bespoke treatment combining several technologies to eliminate fat effectively in all of these areas. Lifts and tones the bum cheeks for a firmer, more toned, youthful bum. This includes a combination of cryo-fat freeze, cavitation, radio frequency and shockwave. This uses 3D duo cryotherapy to target stubborn fat in this area. Helps sculpt and define inner thighs using a combination of technologies. This uses 3D cryotherapy to target stubborn fat in this area. We eliminate the fat that has gathered in this area then continue with contour strengthening. However some clients may just require skin tightening in the area. This uses 3D cryotherapy to banish unsightly pockets around the upper areas followed by radio frequency skin tightening on this area weekly, to help iron out fine lines and tone any loose skin. ﻿This is the latest technology used to target specific focused areas of stubborn fat in the fastest possible treatment time. 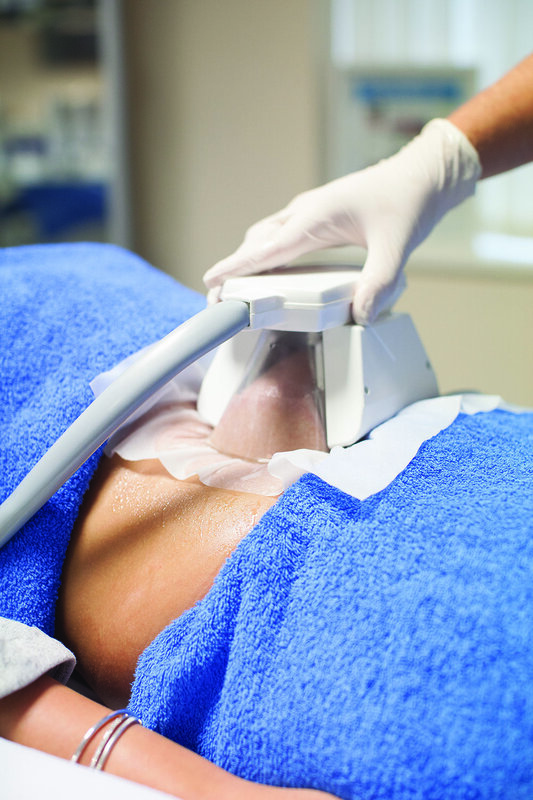 Ultrasound treatment for targeted fat removal on hard pockets. Contouring treatment only to be treated on clients who have had a 3D lipo course to abolish stubborn fat. Results can be seen after 2-4 months.